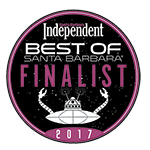 Award winning luxury town home in downtown Santa Barbara w/a walk score of 98! Large 1 bedroom+loft unit showcases an open concept floor plan with wood floors, gourmet kitchen, granite counters, stainless appliances, gas fireplace & private patio. Luxurious bedroom features Juliette balcony, en-suite bathroom with double vanity & oversized walk-in closet. Loft is perfect for overnight guests or dedicated office. Completely gated building with elevator to street level and parking garage. Steps away from renowned amenities - including restaurants, theaters, galleries, museums, historic sites, boutiques and shopping. Less than 1 mile to waterfront and beaches. One Twenty One is the winner of The American Institute of Architects Santa Barbara Chapter Merit Award for excellence in design and has been awarded the coveted Santa Barbara Beautiful Award for 2014.